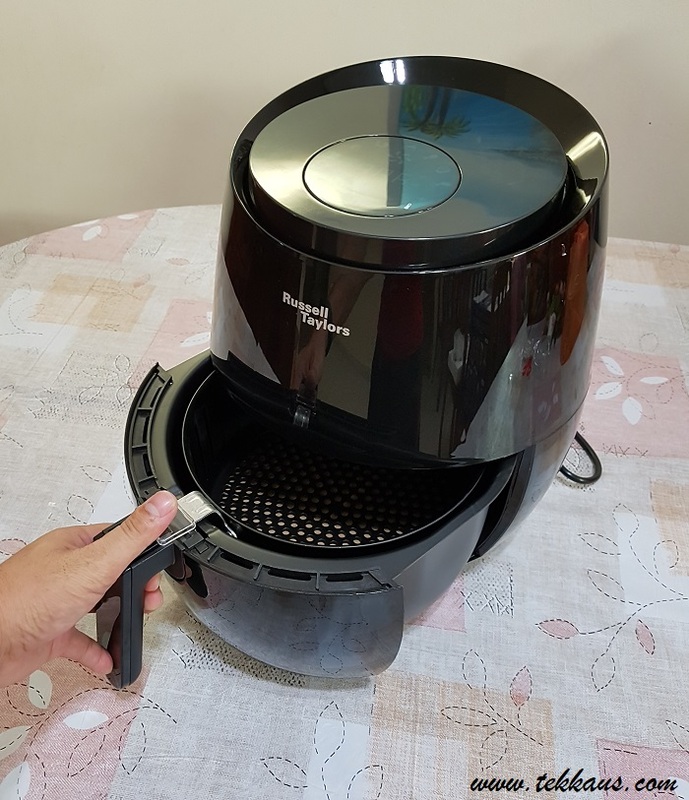 I once thought that air fryer is just a fancy kitchen gadget that will turn into a white elephant soon after you have unwrapped the lavish packaging; I was also very skeptical about the food that you cook with this so-called "frying using the air" technology. 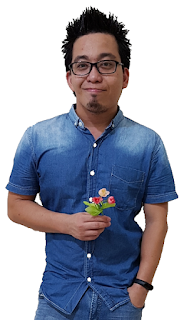 I asked myself, "Will the food even be edible let alone tasty?" 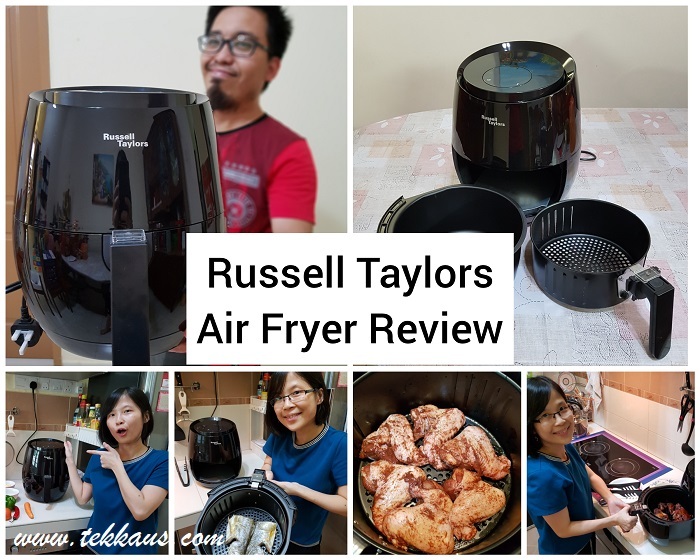 Those are the questions that have been stopping me from believing in any air fryer until...I was introduced to this Russell Taylors' Air Fryer. Honestly after trying it for the first time, my perception of food cooked by air fryer has completely changed. 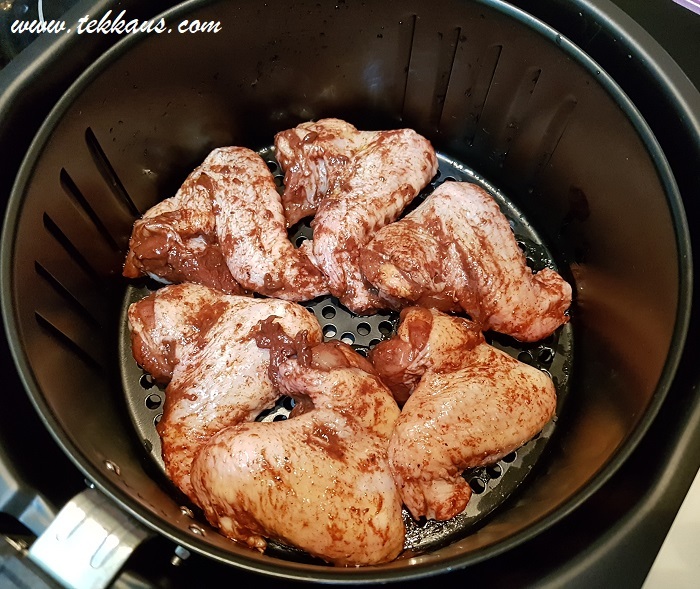 What can you do with an air fryer? 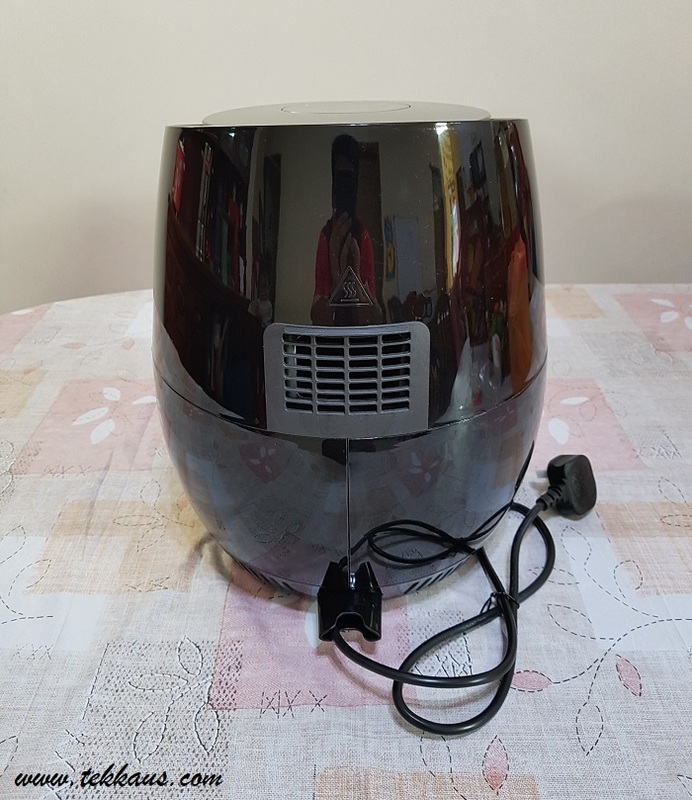 First and foremost, for those uninitiated non-believer like the previous me, an air fryer uses hot air convection to cook your food. 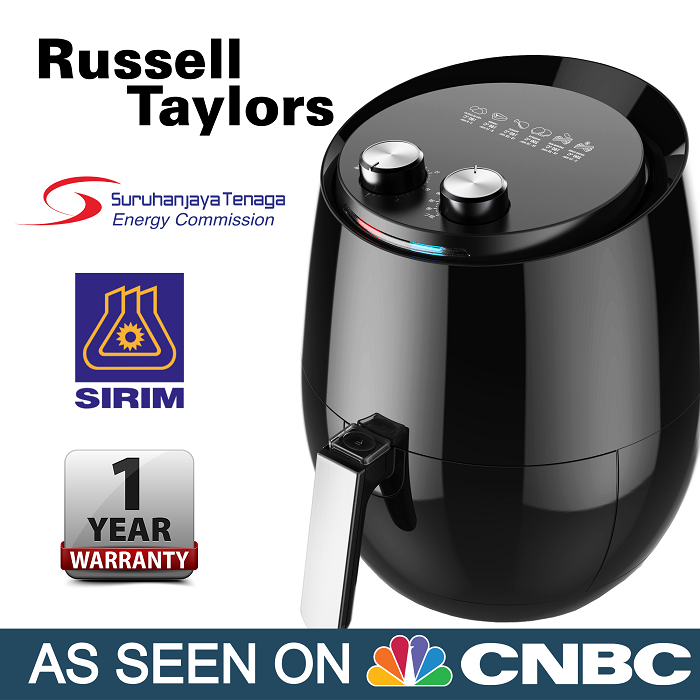 In other words, instead of using OIL to fry your food, an air fryer will use AIR to cook your meals. 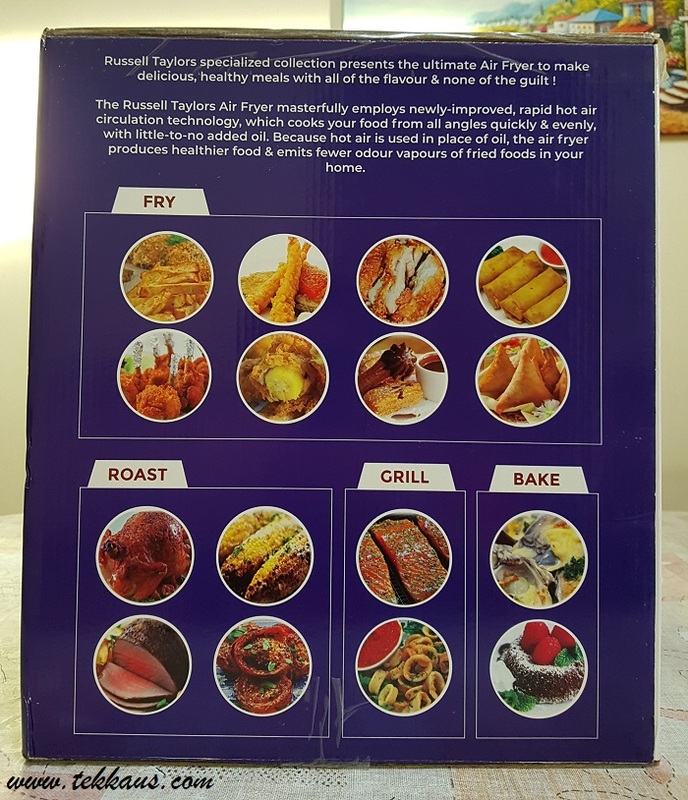 This translates to less oil/fat being used and ultimately you will get to enjoy healthier food which is equally delicious if not better. 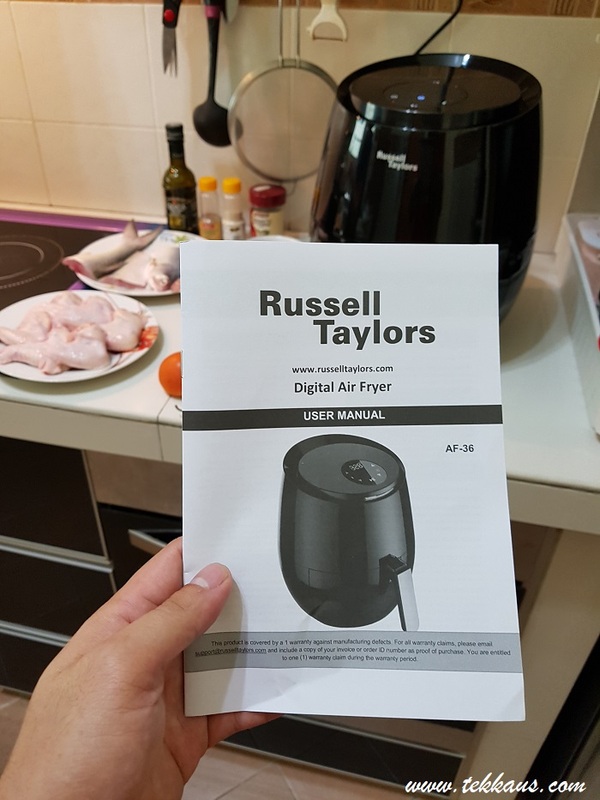 So what is the secret of this Russell Taylors air fryer? Apparently it utilizes advanced, rapid hot air circulation technology to cook your food from all angles swiftly and evenly. 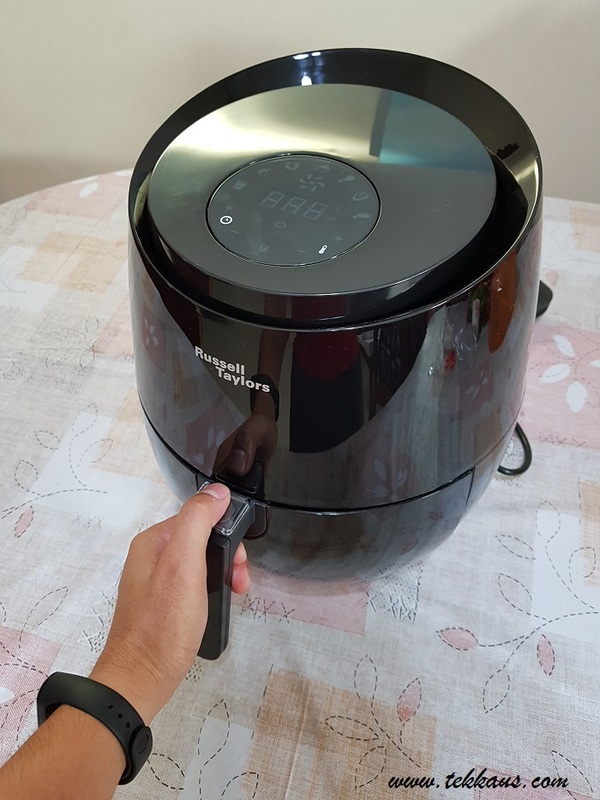 I can't help but fall in love with this air fryer of mine. 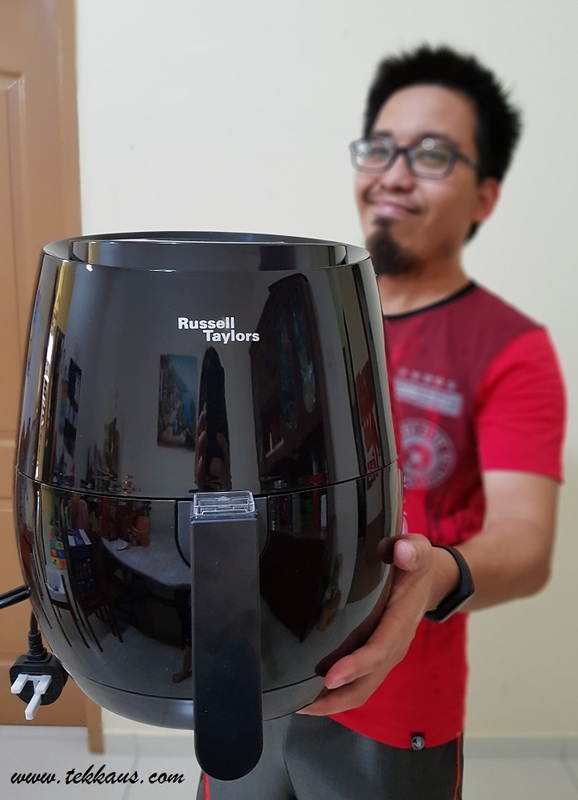 I got myself the Russell Taylors Digital Air Fryer AF-36 XL which is the company's biggest air fryer (4.8 liters) to date. 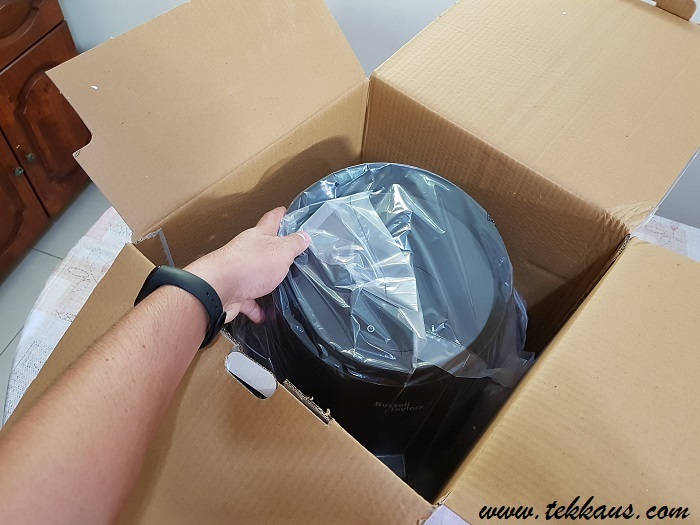 Right after I had ripped the box open, I was greeted by this sleek, jet-black coloured air fryer which really looks like a fashion statement on its own. Its design is simple, yet it exudes so much elegance to it that it can be placed in any corner in my kitchen. The digital panel nestled on top of the machine makes it even more remarkable, giving it that premium, sophisticated touch. OK! I was totally swooned by its look; Can it walk the talk? Let's see. 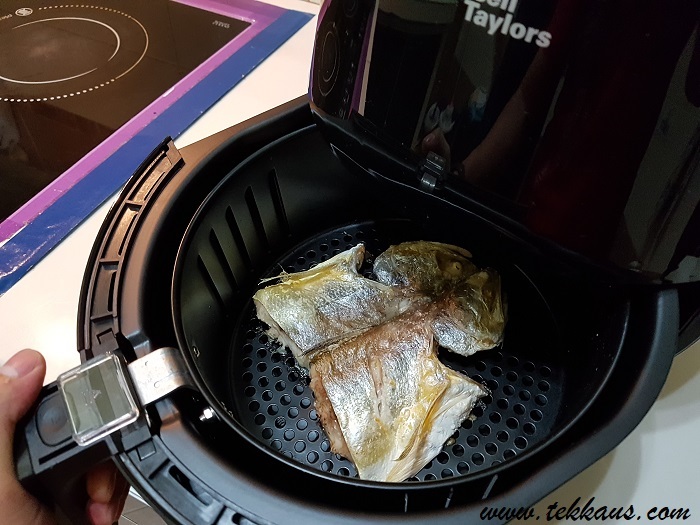 So how do we use this Russell Taylors air fryer? Just look at the huge capacity! 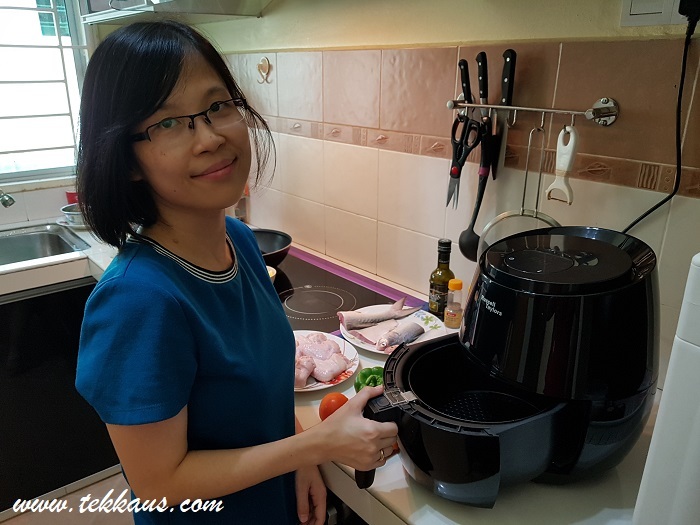 Using the air fryer for the very first time was truly effortless as it was easy to operate even without reading the manual (by you are advised to read it first :p). Pretty intuitive if you ask me! After holding the hand grip, all you need to do is to push the "transparent squarish button" forward to draw out the pan which is nestling the frying basket. To separate the basket from the pan, just press the dial underneath the transparent button to release the basket. This mechanism allows you to wash the pan and basket after dishing out your meals. When in doubt, do refer to the manual...which I didn't because it was really easy to use. 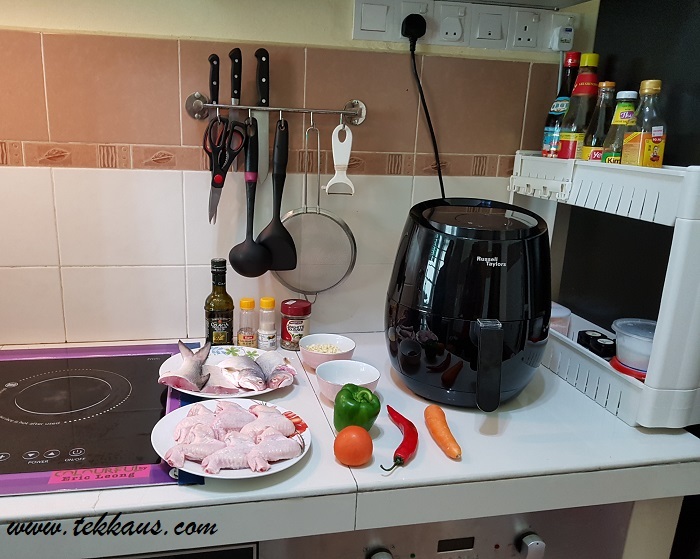 So how do we cook our food such as chicken or fish using the air fryer? It is pretty easy. 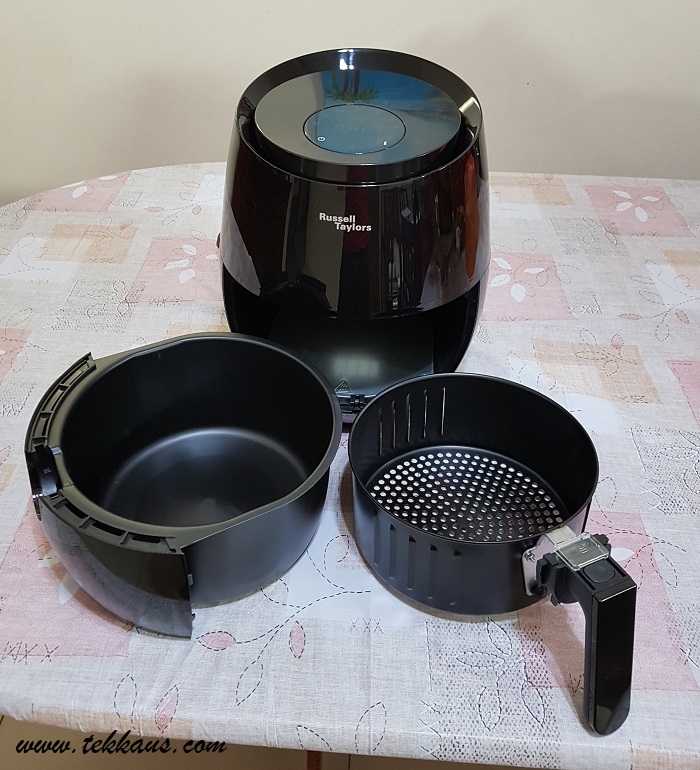 Basically all you need to do is to put whatever you want to cook into the basket and push the pan into the air fryer again. Then the digital control panel will be activated, prompting you how you would like your food to be cooked. 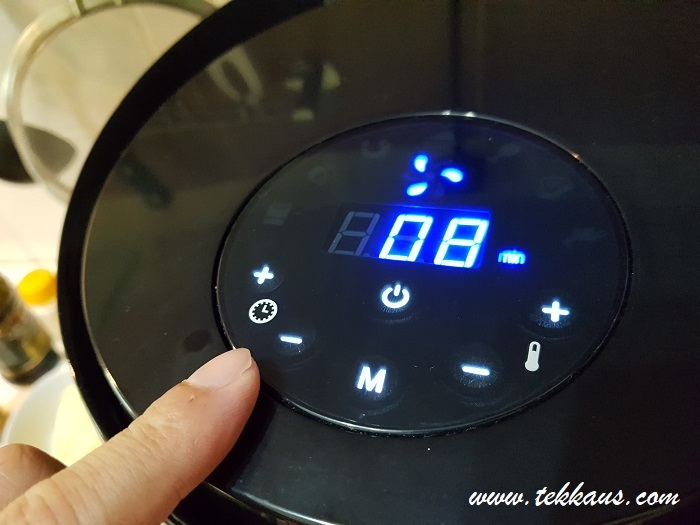 You can either control it manually in terms of temperature and timer or you can use the cooking preset menu (there are 7 to choose from) to cook your food. 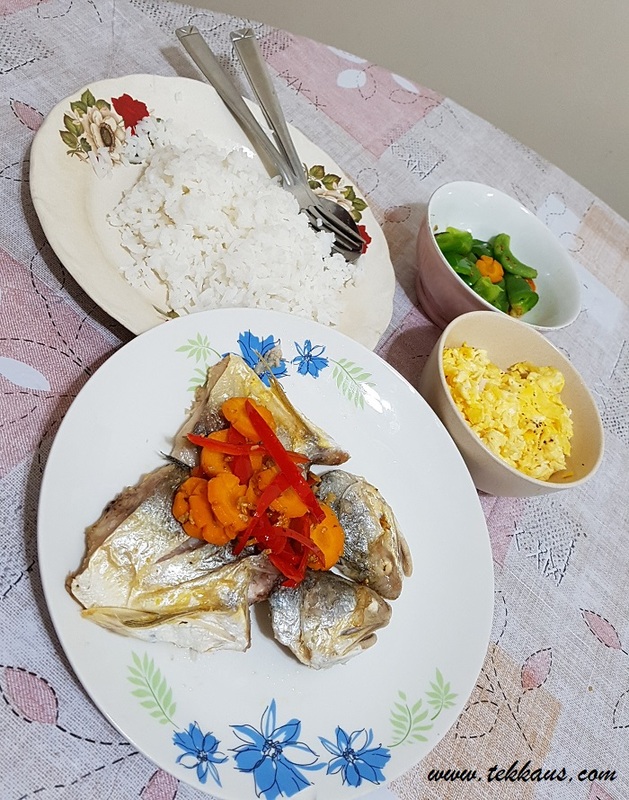 As for me, I cooked my fish and chicken just by using the preset menu, sat back and relaxed! It was really, really easy. After 20 minutes or so, my perfectly air-fried fish and chickens are ready to be served! Voila~it is time to feast! My wife was really excited to use her air fryer. You can use the preset menu to cook your food. EASY! 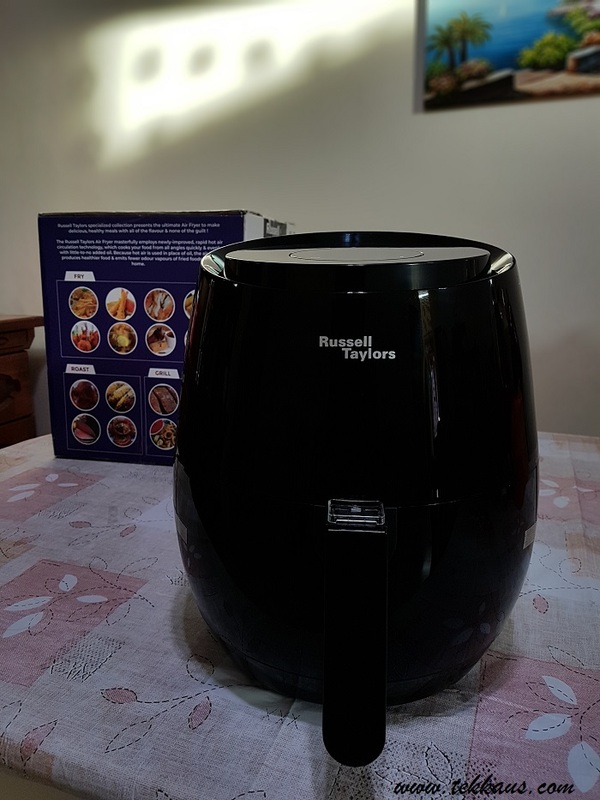 Is the food cooked by my Russell Taylors Air Fryer tasty? Is it better than conventional cooking using wok and pan? The verdict is... *drum roll* the fish and chicken cooked by using the air fryer were really, really more delicious and flavourful compared to traditional way of cooking them *gasped*. To be brutally honest, I did not expect them to taste this scrumptious as I had always believed nothing beats wok and pan. How wrong was I.
Ding! The fish is ready to be served! Crispy on the outside but tender and juicy on the inside! 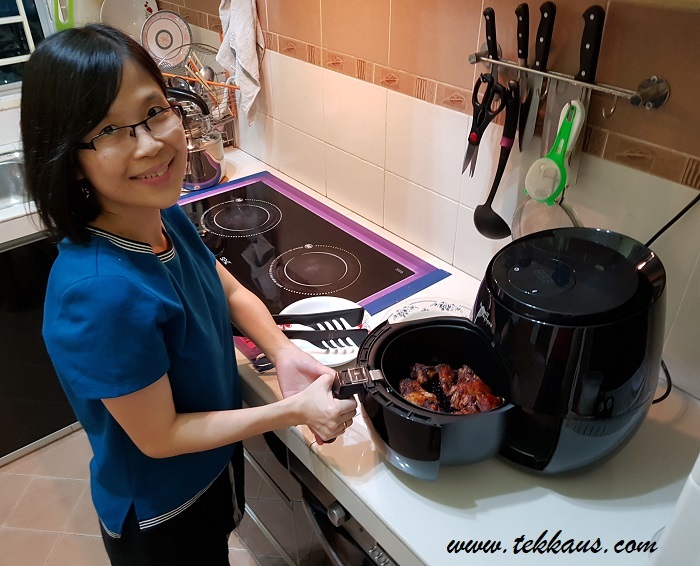 It is easy to prepare dinner with our air fryer now. 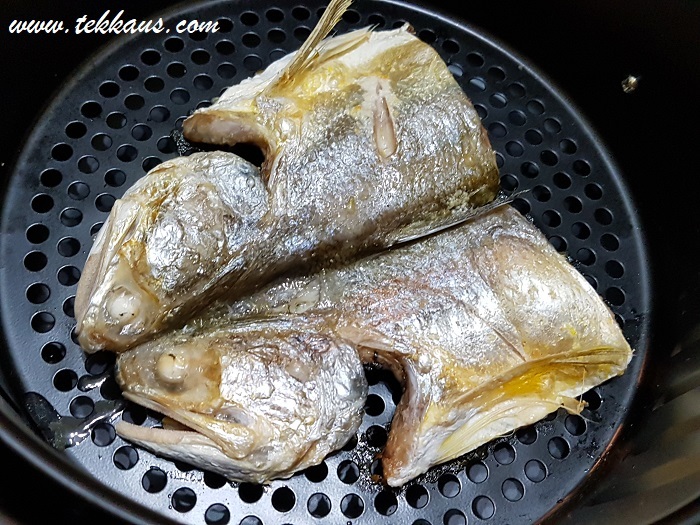 The skin of the fish was so crispy and yet not a single drop of oil was used to fry the fish. The fish was fried to perfection and the meat was so tender, sweet and juicy. I believe the air frying technology can lock the juice in the meat, giving the fish that lips-smacking goodness! I was really taken aback with the results to be honest. 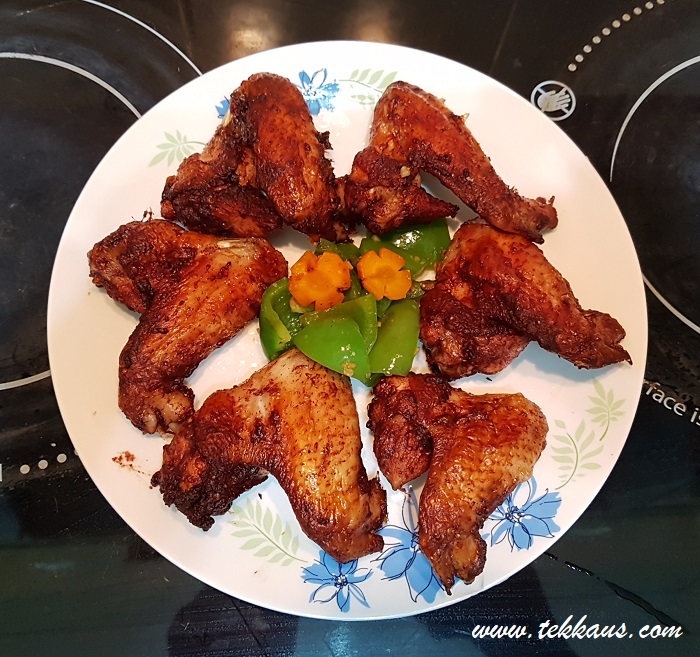 Moving on, we threw in 6 pieces of chicken wings (yeah~the frying basket is really big) into the air fryer and waited for them to be cooked. 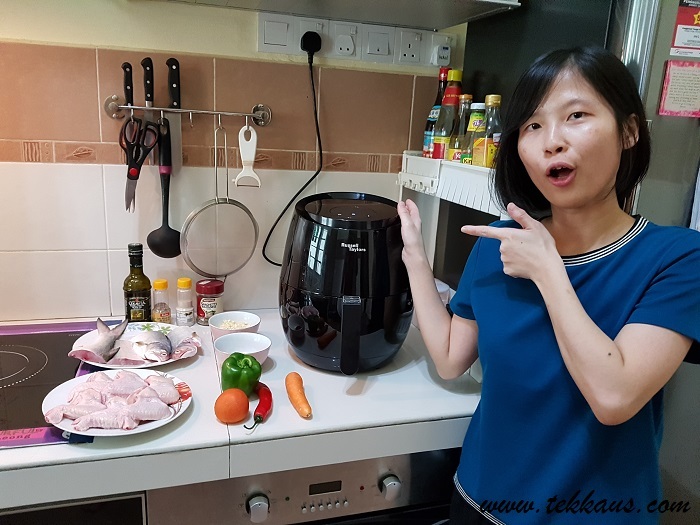 We pressed the desired menu and voila in no time our sleek, jet-black air fryer was beeping, informing us that our chicken wings are ready! Visually, all 6 of the chicken wings were air fried flawlessly as you can tell by looking at the golden brown texture of the skin. But how about the taste? 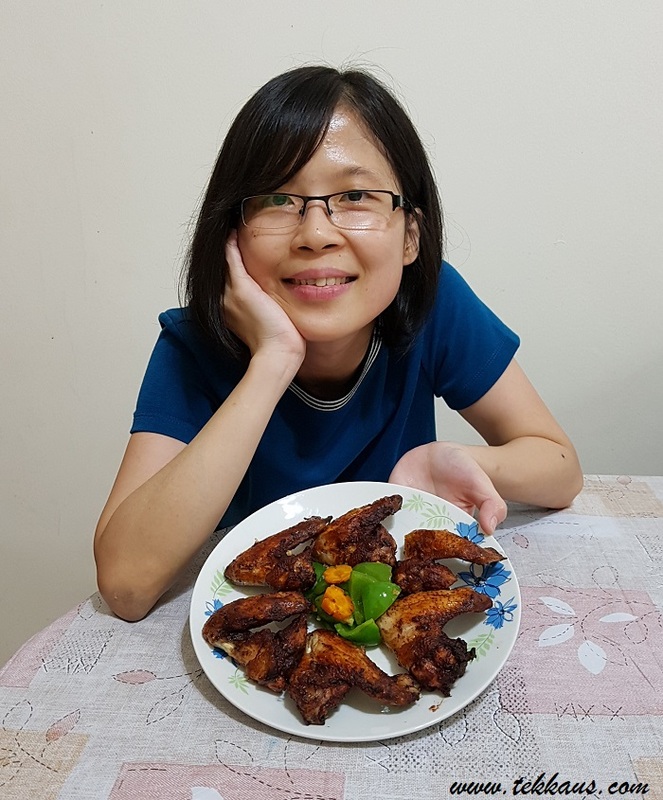 I sank my teeth into the chicken wings and oh my God~immediately I knew that the chicken wings were masterfully cooked. Like the fish, the chicken meat was delicate and lusciously delectable. How was this even possible? Again it was because of the all-angle rapid air technology used by Russell Taylors. I am truly impressed to say the least. Our chicken wings are ready. 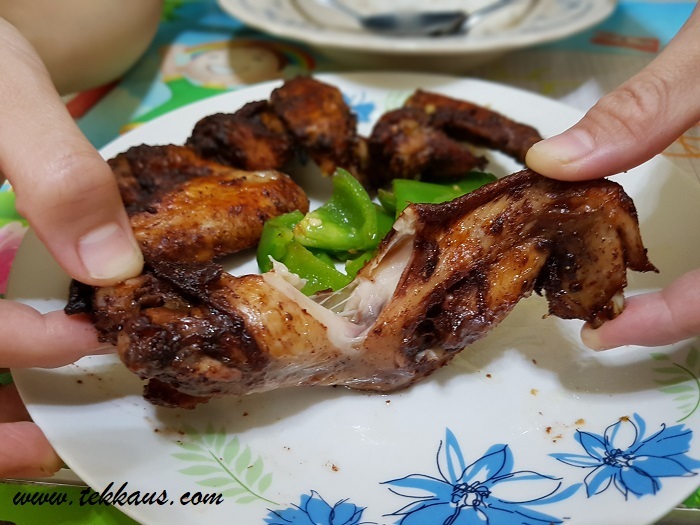 Masterfully cooked without the need to flip the chicken wings or deal with any popping hot oil! 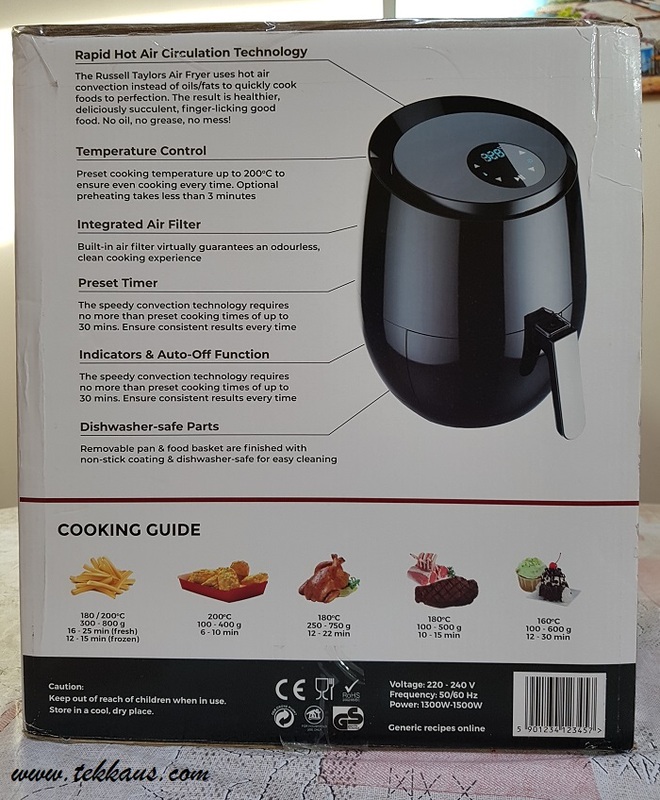 Even my wife who is one of the greatest cooks that I have known, gives her nod of approval for this air fryer. 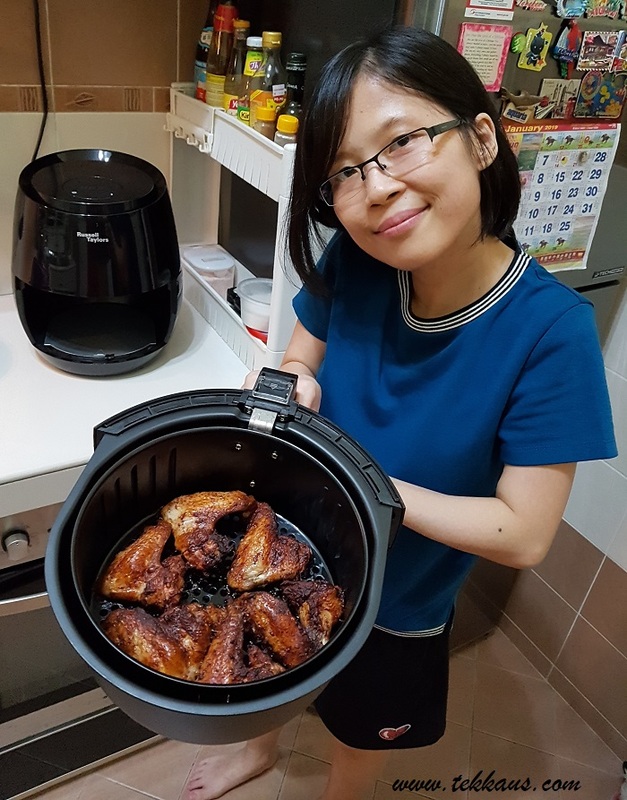 Moreover she claims that besides cooking fish, chicken or whatever we desire to perfection, the use of air fryer also means that she can free up her time to do something else while waiting for our food to be served. This is what we call convenience right? 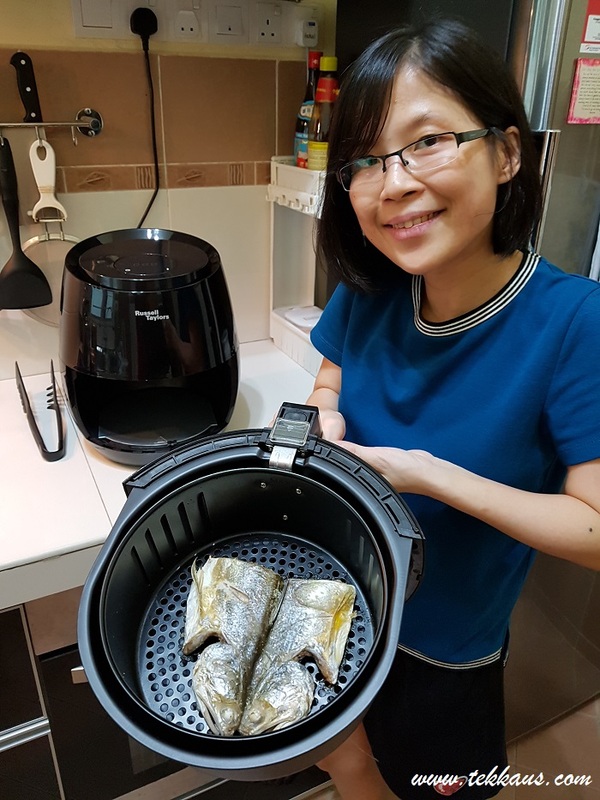 My wife also loves the air fryer because she does not need to sniff in those odours while frying her fish or chicken anymore. Thanks to the integrated air filter, the use of air fryer also means that your cooking will be clean and your kitchen will be odourless. Thumbs up! Wifey is really, really happy with the chicken wings. The chicken wings were really finger-licking good! 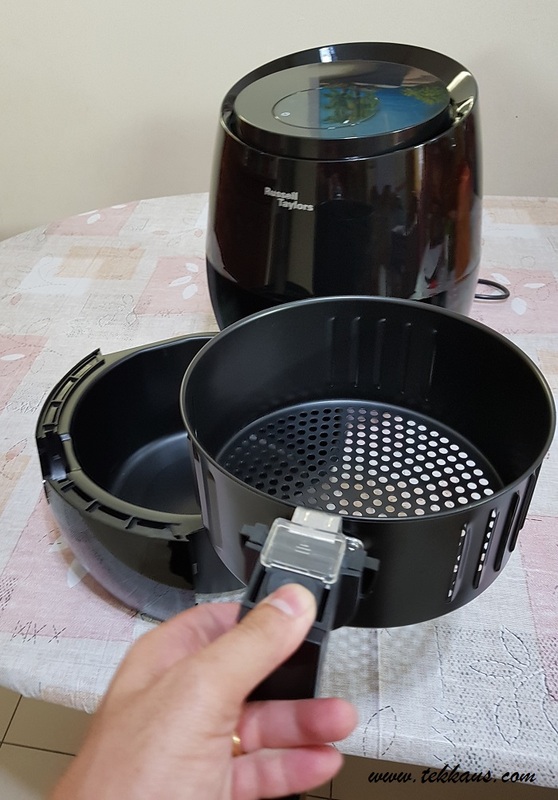 So can an air fryer replace your wok and pan? The answer is no. However I must admit that an air fryer is a must-have cooking companion to complement your cooking experience. 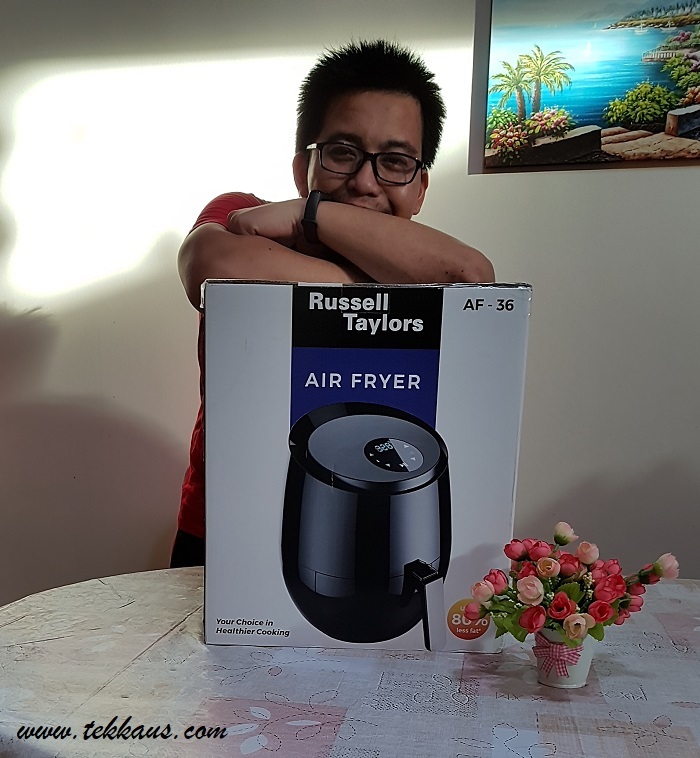 I am really, really happy to get this huge air fryer for my wife. Now she can can cook tasty dinner for us every single day. 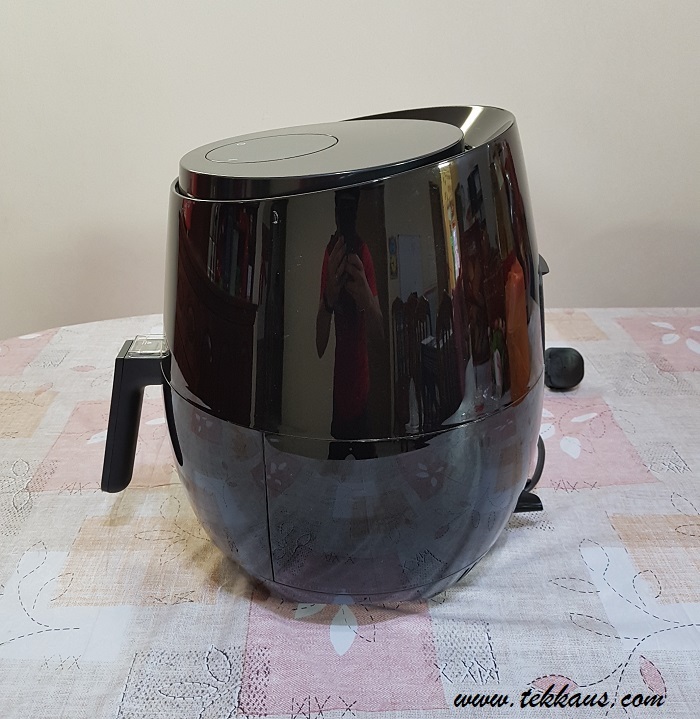 In fact this air fryer is also a multi-cooker which means you can bake a cake, grill calamari and even roast a whole chicken with it! Dayum! I am drooling right now.